Lance Armstrong says no-one "needs to cry" for him despite being stripped of his seven Tour de France titles by the US Anti-Doping Agency (USADA). The 40-year-old American, who maintains his innocence, was also banned for life by the USADA on Friday. There are a lot of good young guys. Cycling is going to be fine. 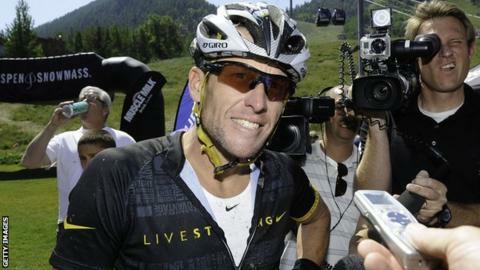 In his first public appearance since announcing he would no longer fight the charges, Armstrong finished second in a 36-mile mountain bike race in Colorado. "Nobody needs to cry for me, I'm going to be great," Armstrong said. "I have five great kids and a wonderful lady in my life. My [charitable] foundation is unaffected by all the noise out there. "I think people understand that we've got a lot of stuff to do going forward. That's what I'm focused on and I think people are supportive of that." The USADA says it has more than 12 witnesses, up to 10 of whom are believed to be former team-mates of Armstrong, who agreed to testify and give evidence that the Texan used performance-enhancing drugs and encouraged others to do so. Who decides if Lance Armstrong is guilty? "UCI (International Cycling Union) is the governing body of the sport, and normally they would be the ones who do the stripping of points, prizes and money, all the things that USADA (United States Anti-Doping Agency) have said. "We are now going to get a row about actually implementing these sanctions and it is going to be messy. "I think it will almost definitely end up at the Court of Arbitration for Sport." Armstrong issued a statement on Friday saying he would no longer contest USADA's charges, explaining he was tired of fighting the allegations. He never failed a drugs test. However cycling's global governing body, the International Cycling Union (UCI), has challenged USADA's jurisdiction over doping in the sport, and has the option of appealing against the ruling to the Court of Arbitration for Sport. Armstrong says he is no longer bothered about racing, having been beaten in Aspen by 16-year-old rider Keegan Swirbul. "It's more about staying fit and coming out here and enjoying one of the most beautiful parts of the world, on a beautiful day, on a very hard course," Armstrong said. Donations to Armstrong's foundation have increased to 20 times their daily average since his ban was implemented, and Armstrong said he was appreciative of the support shown in Colorado. "The people, like the people who are standing around the course, they voiced their opinion in the last 48 hours and are going to support us," he added. "There are a lot of good young guys. Cycling is going to be fine." How does blood doping work? Read more on How does blood doping work?